It would be best to check with Rudolph Research themselves, but this would be my interpretation of the numbers. 1 Refractometer Brix = 8.38. Pure water has a refractive index of 1.3330. If you add either sugar or alcohol to the water the refractive index will increase. The 8.38 is the apparent brix, assuming that there is only sugar (and water!) in the sample. 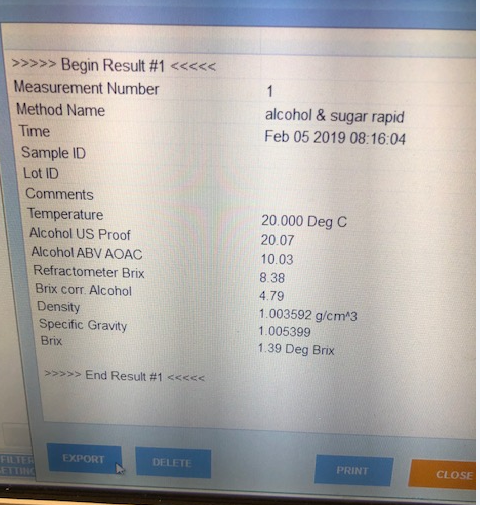 There are an infinite number of combinations of alcohol and sugar concentrations that could give this apparent reading, but fortunately if you know the density as well as the RI you can calculate what the true brix is. This number (8.38) is pretty meaningless by itself, but is needed in combination with the density to get the true brix and ABV. 2 Brix Corrected for Alcohol = 4.79. Using the apparent brix of 8.38 from the previous step, together with the density of 1.003592 g/cm3, the true brix (and true ABV) can be calculated. This is the best (only) indication of how much sugar is left in the fermenter. 3 Brix = 1.39 Deg Brix. Unlike the refractive index where adding either alcohol or sugar increases the RI, the density of a solution is increased by adding sugar but decreased by adding alcohol. If you used an hydrometer calibrated for brix and put it in your sample it would indicate an apparent brix 1.39 and not the true brix of 4.79 determined above. The presence of the alcohol lowers the density and therefore the apparent brix. This number is also pretty meaningless in my opinion. I don't know why RR give so much detail on the brix but not on the ABV. The density meter and the refractometer will also give apparent ABV readings, but these seem to be ignored and they show only the corrected ABV. So 4.79 brix indicates some sugar left. maybe not a complete fermentation or some unfermentable sugars.? Residual sugar levels, target alcohols, yeast tolerance etc are a whole different topic. I suggest you start a new thread for that. It's not something I can help much with. SG of 1.005, if that’s the actual SG, is the number to watch. For us, complete fermentation is 1.000 or slightly below for grain.